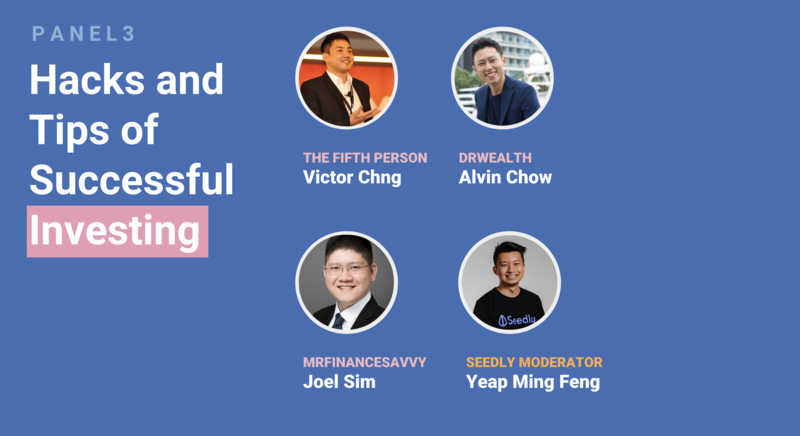 In this third panel, we will be discussing some hacks and useful tips to successful investing. Come hear our panel speakers as they share some tips and tricks with you! This panel is moderated by Ming Feng from Seedly. Could you consider cryptocurrency as an investment? Do you benchmark against absolute return rather than the sti benchmark? Will roboadvisors beat the normal TA and FA? Will the skillset we learn today be obsolete due to advances in technology? The market is already quite efficient without robos. In fact, robos aren't as efficient as people think. Stashaway is trying to beat the market to some degree, for example. I don't really think the skills you learn will have anything to do with their ETF strategies. Declining popularity of Heinz's products- in a world that values healthy eating got me reevaluating F&Bs. How are stocks like McDonalds doing better despite healthy fast food alternatives eg. Subway? I gotta agree with Jonathana - Subway is not my idea of fresh/healthy food as well. I always wonder about the 'Eat Fresh' slogan when I see the tomato slices lying there for hours. I think that while there is a part of the world that values healthy eating, there is still the mainstream that is looking for taste over health. In Singapore alone, just look at the snaking queues for bubble tea. When I was in L.A., I definitely felt that the folks there are more health conscious, but also because it was trendy to eat avocado toasts and acai bowls. On to McDonalds itself. 85% of the company in 2016 was represented by franchisee-run locations. Here's the thing: McDonald’s makes much of its revenue by buying the physical properties and then leasing them to franchisees, often at large mark-ups, instead of collecting a lot in royalties or selling its franchisees cooking equipment. Additionally, we know that McDonalds had recently announced in end March 2019 that they will acquire Israeli startup Dynamic Yield, a technology company focused on personalization and decision logic, for $300 million. The aim is to create a more personalized experience that will include new outdoor digital drive-thru menu displays that can change depending on the time, weather, current restaurant traffic and trending menu items. Additionally, the tech will also be applied to digital customer experience touch points, including self-order kiosks and its Global Mobile App. All this is to look at increasing 1. average customer spend and 2. order volume. You can see where they are headed with this. On a side note, I realize the last McDonald's meal I had cost me $10! It just baffles me how much one can spend on fast food, which is supposed to be cheap. For the layman and woman on the street, how does one avoid another Hyflux incident? If you are 20 years old now, what will you invest in and why? Hi there! I started by investing in a traditional high yield savings account, to take advantage of compounding! I personally use both the DBS Multiplier account and POSB SAYE Account. To maximize the interest rates (2.0% p .a. ), I deposit a fixed amount every month from the DBS multiplier account to the POSB saye account. I like having a separate savings account because it prevents me from touching the money and let the effect of compounding be maximized! What is the difference between mutual fund and ETF? Just to add on to what the others have shared. Mutual funds usually reside on a platform where there are fees involved on top of the fund's management fees. Dividends, if any are taken off the NAV. And there may also be a sales charge when buying funds, usually 3 or 5%. Some etfs can be traded 24/5, so you are not limited to just market hours. Depending on the platform used, there may be platform fees incurred as well for etfs. But this is usually minimal as compared to the ones for mutual funds. There are management fees for etfs as well but this is usually very minimal, less than 1% or even as low as 0.04%. Is it advisable for me to hold on to my savings until a stock market crash to invest? Well I think timing the market is truly a difficult thing to do. If we could all time the market well, we would be millionaires, and there wouldn't be a need for Financial Analysts and brokers any longer! I think the best thing to do is to evaluate the company's value - is the company's current stock price in the market lower or higher than your calculated intrinsic value? if it's lower, then no matter what the price will eventually go to this intrinsic value according to your calculation - it's a buy! if it's the other way round, then you could possibly short the stock as you anticipate an eventual fall in price as investors start to not see the value in the stock and sell off. If not, perhaps Dollar cost averaging can help you as it removes the need to time the market completely - your good buys balance our your bad buys, so eventually the price averages out. That being said, there is no need to be eager to jump right in! evaluate what you want to buy, read the news, get enough supporting evidence to show that the firm will do as well as you believe it will, before you invest. You can really see a much better chance of profits in this way! Nicholes Wong: But if the dividends are 4% every year, where does the 4% go? Wouldn't that be a huge loss compared to buying the stock itself (esp when compounded over many years)?